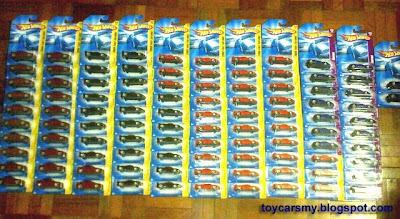 For a single Hot Wheels model how many units you purchase? 1, 2 or 5? Some people bought two to have one open loose and the other one for keeping, but can you imaging there are collector bought 10, 20 for same model, same colour. Picture below only consist 4 models, Lancer Evo X Red, FXX Black, FXX Red and Enzo Blue. At one glance there are over 100 of them!! I guess this collector must love these models very much. What do you think? Die-cast market are always filled with these kind of ppl. Don't know how to say! As I know, they belong to TKT, a member of Lowyat and he often do trading in this forum. With me, love or hate doesn't mean you must collect many like that. He has stolen chance of other collectors who really want those cars. tkt isn't such a person OK? he shares with us the things that he bought. he bought them and release to members who wants that model but can't get them at the market. his prices are really really too good to resist. so he's not a SCALPER ! Umm, ok, I can't retract my previous comments. I appologize for the insinuations/accusations. Frustration got the better part of me today. Sorry. tkt has his ways to get those stocks as he has contacts i believe. he didn't take advantage of the situation like getting an evo x and selling it at ridiculous price. his pricing are almost retail most of the time so he's just a good chap trying to help collectors. he had help me alot and i am really grateful to him! then how come he wanna get all?? he can just take 1 or 2 and then tell others that the particular place got the stock. the situation is like this. ok, i see the place have alot of evo x wave. and i bought two for myself. then i post at forums that the particular place have alot of evo x. then at the time i post, the evo's might have been gone and make their way to ebay at a 'good' price. so why don't i buy them all and release to fellow collectors at retail ? does it make sense? it make sense to me..
Then how bout those ppl who dunno TKT? then they won't "enjoy" the benefits right?? he did post in the lowyat forum that anyone can get from him..
looks like his good intention to help fellow collectors has been defined as selfish. if he is selfish, why don't you say those TRUE SCALPERS selling at ridiculous prices at ebay? you see.. you say ppl that doesn't know tkt will not enjoy benefits. 1) Can anyone confirm that the evo x wave has hit KL? Where? when? 2) If TKT has contacts (like within the mattel factory or say TRU) and is able to get EVO Xs (or any car he wants in quantity), then he has already taken advantage of the rest of us because he has removed the cars from circulation unfairly. That's worse than someone going into a shop and buying all the cars he/she likes. 3) if he doesn't have contacts, and the evo x wave hasn't hit kl, where did he get them then??? TKT should respond. actually when i found da Evo-x wave, i was just doing daily hunting. then reached a spot, saw new cartons (around 20+), i was so happy coz thinking 2 get TH already! but, i asked permission from da staff, he allowed me 2 search da 'new cartons'. well~20+ new cartons but i only found 2pcs TH Buick & 1pc TH Plymouth! u should knows wat already happend! if i got contact from tat spot, am i da 1 who suppose 2 get all da TH??? i back home & posted in LYN bout my new wave found ( i din mention da location). found out there r a lot ppl wan da Ev0-X, so i went back tat spot 3days after tat (lucky i din mention da location)& get all u can c in my pic! oso da black FXX & blue Enzo. da red FXX acctually hauled in 7-11 during Viper hunt. i went around 15+ outlets just 4 it. when u all c tiz post, 50% in da pic already gone coz is on da way 2 fellow collectors. RETAIL! those who request 2pcs Ev0-X, some only get 1pc coz i wanna share wif more collectors. Nobody know if nobody tell. Dont think the situation is like this. i wonder why some commenter's so not happy when there is a people that help collectors around here.i buy a few extra cars and i sell also to forumers RM 5.00 to RM 6.00 each. I didn't take advantage of the situation. Wrong guess. Anonymous is a father and has a 7 yr old son and 3 yr old daugther that both like hotwheels. My daugther don't really care about the make or model, just the colour... but my son knows his cars very well... very very well. Pardon my English in the previous post: "My daugther don't" is wrong. It's suppose to be "My daugther doesn't"
I don't even know what a "scalper" is but he isn't playing fair... at least not by the average person like me. PS. I hope I'm not the only person who is really annoyed with TKT (or people like him). I don't think that TKT is a "SCALPERS". Just don't know what he did. By the way, still very surprised about his action (buy mass quantity then re-sell to collectors as same price). Very great! TKT is selfish, i don't believe there are ppl hunting around just to help other collectors, you think we are stupid? Don't call yourslef TKT, call yourself "HELPER" lar! I think TKT like to show off!!! Why would a person go so many places including 7-11 to hunt? Since he got those cars that he want already, why still hunt for same cars? Why go many places to hunt and sell at normal price? Maybe he wanna show off? Maybe he wanna sabotage the market? What benefits does he get eventually? TKT is a rich kid desperate for fame. He can give the cars away for free but that doesn't make him any less objectionable. I don't have any problem if he wants to buy cars by the cartons...... why must he open new ones and pick out the ones he favours... sheesh....... grow up TKT. Hei rich kid, go buy real car!?@#! why hide under the nick anonymous? I think his motive is simple..
Buy 2 free one at Jusco for RM9.80, then sell to others for RM6.00. Each car earn RM2.70 x 100 unit. Good $$ huh, for short turn over. Stop speak on behalf of TKT, you are not in the position..
You know who to blame? Mattel. Why would they wan to short pack the nice cars aka FXX, EVO X etc in the first place? If they flood the market with nice cars this thing won't happen. Mattel is getting their marketing strategy all WRONG. Dear Mattel, learn from your competitor/arch nemesis Hasbro. See alot of TF toys in abundance? See that the once rare BB08 and UBB was later flooded into TRU? Give what the consumer wants!!! What Tkt is doing is a double edge sword, have some benefits, but at the same time cause some anguish. So I'm neutral on this. then you guys better go tembak those people at ebay lah..
you don't deserve my respect so why should i listen to you? not in a position? haha.. a great joke.. then who are you to comment about tkt? are you a great SCALPER who sells RM 100 DD Thunt $ at ebay? Yeah I do agree Mattel has some probs with their selection, as in the wanted models are not in enough supply. Perhaps they should do a market study... If they follow Hasbro and flood the market with good models/models people want, it should be cool for everyone. b4 u all run ur mouths any futher n embarrass urselves.. pls read t post from TKT.